Rue Bee and Winston are long gone, and I'm missing them like crazy! I loved exploring Melbourne with them. Even though I've lived in Melbourne for the past 3 and a half years, I (sadly) haven't had very many chances to explore the surrounding regions. 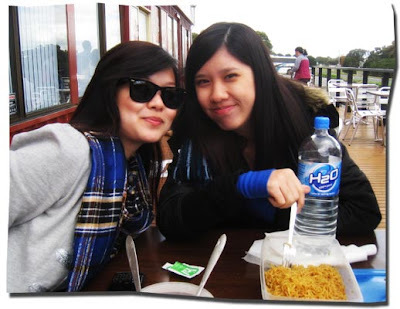 One of the places we visited together was Phillip Island. The four of us, Jace and I, and Rue Bee and Winston, got a discounted tour package. The tour took us to four locations on Phillip Island - Panny's Chocolate Factory, Churchill Island, the Nobbies Centre, and the Penguin Parade. My favourite place, I have to admit, was Panny's Chocolate Factory (the Penguin Parade came in a close second, though!). They had so many chocolate-related displays! They had a few games, that you could play in order to win chocolate. There was a large chocolate block hooked up to a weighing scale, and you had to try and guess its weight by standing on the corresponding scale to try and balance out the weight. 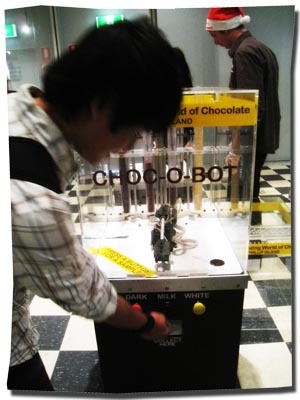 There was also a chocolate squiggle machine, that allows you to draw your own squiggle of chocolate. 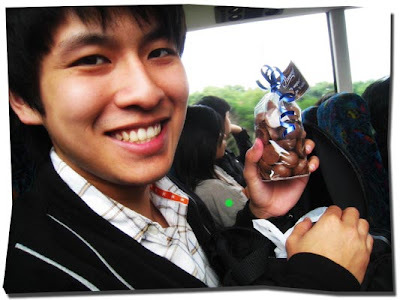 My absolute favourite chocolate at Panny's was their Signature White Truffle. They gave us a sample as we walked through the door, and I loved it! I went looking for it after the tour, at the chocolate shop. I finally found it, but I found it kind of pricey, so I decided not to get it in the end. But the boyfriend bought it for me and surprised me on the bus! He disappeared for a while, and then when he reappeared, he dug out the bag with a sneaky little smile. It was so sweet, and the chocolates are sooo good! I tried an online search, and I found out that Panny's has only very few select locations where its chocolate is sold, so I guess that means it's the only packet of Panny's chocolate I'll be having in quite a while. But oh, how I will dream of it!